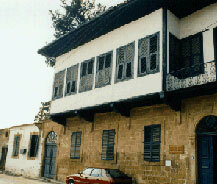 In front of the car park in the direction of the Armenian Church places the recently restored Dervish Pasha Mansion, opened in 1988 as an ethnographic museum. Dervish Pasha himself was the editor of a newspaper named Zaman (Time), the earliest Turkish newspaper in Cyprus, in 1891. The house dates back to 1807 and, perfectly offered with whitewashed walls and blue carpentry and rafters, is laid out in a room-by-room re-creation of an early 19th-century mansion. Downstairs are the service rooms: kitchens, stores, with shows of cooking tools and agricultural equipments; whilst upstairs are the living lodgings, furnished with leftovers of a generous lifestyle: embellished bath-towels, elegantly delicate purses, fine old carpets and luxurious outfits including various classic platformed mother-of-pearl bath-shoes. In the open yard are the baths and washrooms, and in a corner an attractively laid-out refreshments area offers soft drinks and tea.